No, this is not about what you are thinking (knowing me, that could be possible). It’s about a health treatment I had at a spa that changed my whole thinking about my life. Whenever I go to a spa, I want to try things that I’ve never tried before. So this time I signed up for a holistic iridology session, where they look at your eyes and tell you about your health. But as the naturopath and I were talking, she thought looking at my blood might be a little more helpful, so I agreed. When I say looking, I really mean LOOKING. She took a tiny prick of blood from my finger and put it on a glass plate to look at it under a microscope. The image was then projected onto a large computer screen so I could see it too. The first view was like a glorious snowstorm at night: swirling white circles against a black sky. Beautiful! Then she focused in closer. At first it was scary—I mean, what if she saw something horrible in there? But as we got going it was just so fascinating I forgot to be afraid. She showed me what a healthy red blood cell looks like, a strong white circle with a dark center. “What are all those cells that are filled in?” I asked. Well, she said, “You are dehydrated.” Not only was I in fact thirsty at that moment, but I also had an immediate outpouring of love for my blood cells. Kind of like when you see a small child or kitten or puppy that is in need, that kind of love. I wanted desperately to take care of my blood and make it better. Now, those cells on that glass plate were already gone and dying, but what about the millions or billions of cells still inside of me? OH, MY GOSH, someone’s got to get them some water! All the time! Poor little babies! It felt so strange and wonderful to suddenly feel the love and desire to care for my blood cells the same way I want to care for my children. It took the whole idea of “taking care of myself” to a whole new level. After all, it’s not just me; it’s all those little guys, too! They need me! As we looked closer, she could see I might need more iron. And I could also SEE what inflammation looked like. Amazing to actually see it in my own blood. It felt much more urgent to try to take care of it and make the inflammation go away. I could also see little bits of fats from my lunch floating around getting gobbled up by my cells. I hadn’t noticed a single bit of fat in my lunch (this was a very healthy spa lunch, after all) and yet, you could see even the little bit of natural fat in my meal. Imagine if she would have taken a blood sample two days earlier when I’d eaten fish and chips! 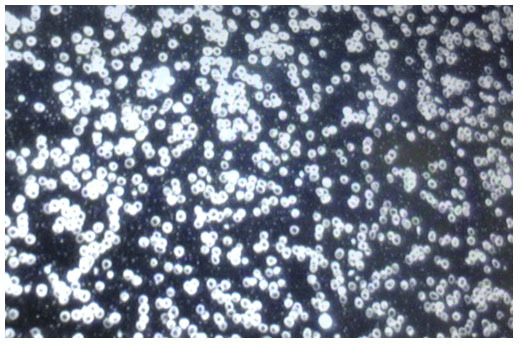 Lastly, we looked at my white blood cells, since they are the last to die after leaving the body. Thankfully, they were in the right ratio to red blood cells, which means I am not fighting off any sort of disease right now. But can I tell you white blood cells are absolutely amazing and beautiful? We had to magnify even further to see beyond the white little balls they looked like from the other view. Up close, they sparkle! They move! They are like amoebas wearing sequins that sensually glide about looking for problems to solve. Or as Pia, the naturopath, said “like a hoover vacuum cleaner sucking up dirt.” A sparkly hoover! What was so transformative about meeting my dying cells up close and personal was that it made the idea of keeping myself healthy so much more personal and essential. It’s not just about me…I’ve got a whole village inside of me now to take care of! That might be a female way of looking at it, but we females are always good at taking care of others before we take care of ourselves. And suddenly, I could see a new reason to take better care of myself. There was even one dying red blood cell that had a frowny face. OK, guys, from here on out I promise to take better care of all of us! 9 Responses to Oh My, Blood! Wow, that’s very cool. I really connect with the thought of making health personal. It’s easy to take our bodies for granted and assume that since they’ve been keeping us living this long, we must be doing something right. WONDERFUL! Intriguing!! That’s exactly the kind of thing that has to happen to me in order to really “get it” sometimes! Like when you see photos of a smoker’s lungs, for instance. But, even with your description I feel inspired and interested! Thanks for sharing!! Fascinating and inspiring article! I want to look at mine! What spa offered this? I presume it is as informative as the person is experienced in reading them. Thanks for always sharing interesting, relevant information. That is really a fascinating aspect to the spa/farm. This reminds me of the movie “Osmosis Jones” with Bill Murray. Hilarious!! I too would love to hear about what health spa you were attending? I have heard of great ones in the Philadelphia and Pittsburgh areas, but never locally. I enjoy your daily emails so much and applaud your dedication to natural health! Live Blood Analysis is an excellent modality to really see what’s going on at a cellular level!! I had as much fun as you did! !